While standing at the altar, about to marry a handsome, charming, and successful attorney, Ashley Braxton catches a shared look between her betrothed and her maid of honor—one which tells her she can’t go through with the ceremony. And when she’s crying in the bridal room of the church, trying to figure out where it all went wrong, she has an epiphany. Ashley realizes that she’s been the consummate pushover her entire life, and now she’s living a life for everyone but herself. Jessie, Ashley’s carefree friend from college, tells Ashley that she can have any life she wants. All she has to do is manifest it. Ridiculous, Ashley thinks, and not understanding the power of manifestation, she blurts out her dream life to a couple of strangers in an elevator. Thinking nothing of it, Ashley carries on with the life she doesn’t want. But soon her checklist of wishes begin to come true, starting with her dream guy. Could manifestation really work? Could she have the life she’s always dreamed of having? Ashley begins to believe that she can, giving her the courage to take control of her life, but just as she does, her ex shows up and tries to ruin it all. Will she give up and remain the consummate pushover forever or will she stay strong and fight for her dreams and desires? Amazon Kindle version vailable for only 99 cents! The paperback version of the book is available on Amazon.com right now for $10.99! This book has helped me to realise what I want from life, what I want to do for my future career and is helping my revalute my love life by manifesting it all! I have started to manifest what I want and I hope it works !! This book had a good storyline. I had read another book by this author and didn’t think this book could be as interesting and easy to read but it was. Great buy. Fun read, By Sandra P.
I love books like this one and it was everything I was hoping it would be. A great read for anyone who loves romantic comedies. From the start this book grabs your attention. The characters are credible and the book had a feel good factor all the way through. This book was very funny…..& extremely motivational!! I truly was intrigued with the entire book. I must have experienced just about every emotion a person is capable of feeling. I give it 5 starts bacause its a great book, the characters are well described and the plot is really interesting. 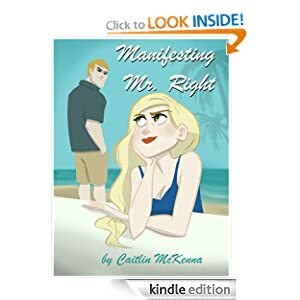 CHECK OUT CAITLIN’S NEW BOOK! This page took 0.751 seconds of computer labor to produce.